Power BI makes it easy to deliver valuable insights across your organization. We’ve heard many stories from customers who’ve made a tremendous impact by publishing content that became critical to every day decision making. But sometimes it has been hard to precisely quantify the impact and understand what data is being used, by whom, and for what purpose. It’s easy to start taking advantage of usage metrics. Simply navigate to any dashboard or report that you have edit permissions to. From there, select the new “Usage metrics” option at the top right. You’ll be presented with a pre-built report which shows the usage metrics for that dashboard or report over the last 90 days. You will see, for example, the number of views and viewers on your content, and how those numbers stack up compared to other dashboard/reports in your organization. You’ll be able to slice based on how your end users received access, whether they were accessing via the web or mobile app, etc. As your dashboards and reports evolve, so too will the usage metrics report, which updates every day with new data. 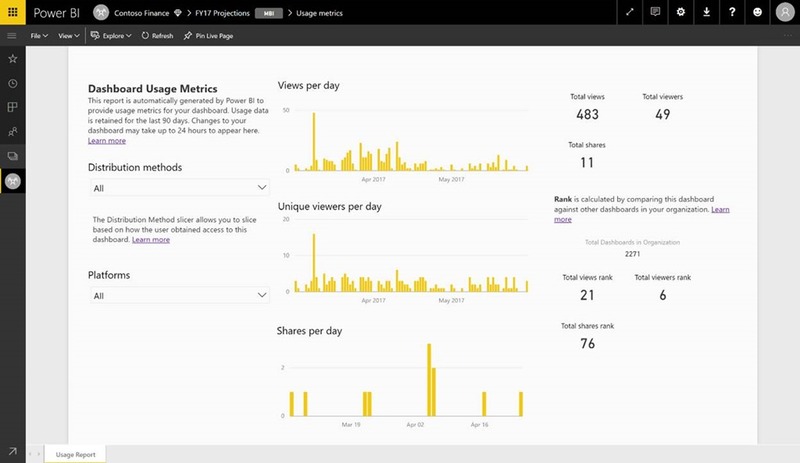 Usage metrics will be a powerful ally as you work to deploy and maintain Power BI dashboards and reports. Wondering which pages on your report are most useful, and which ones you should phase out? Slice by report page to find out. Wondering if you should build a mobile layout for your dashboard? The usage metrics report will inform you how many users are accessing your content via the mobile apps vs. via web browser. Tip: usage metrics are presented as a pre-built report, so you can pin any of the report visuals to a dashboard, to monitor them more easily or share usage with others. To get even more out of usage metrics, you can use the “save as” feature to create a copy of the pre-built usage metrics. Once you’ve created a copy, you’ll get full access to the underlying dataset, allowing you to fully customize the usage metrics report to your specific needs. 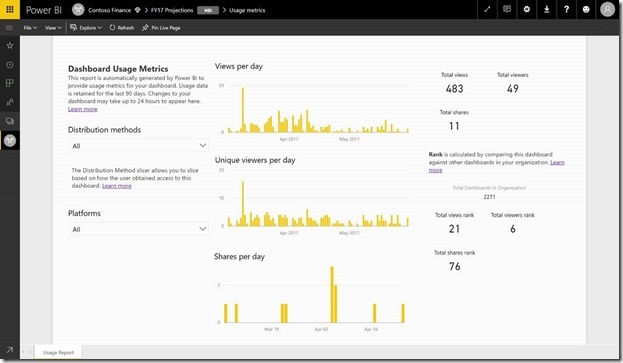 You can even use Power BI Desktop to build custom usage metrics reports using the live connection to Power BI service feature. Better yet, the underlying dataset includes the usage details for all dashboards or reports in the workspace. This opens up yet another world of possibilities. You could, for example, create a report which compares all dashboards in your workspace based on usage. Or, you could create a usage metrics dashboard for your Power BI app by aggregating usage across all the content distributed within that app. Content creator usage metrics are now broadly available, so go forth and explore! We’re excited to see how you’ll magnify your impact with this feature.